Hey there my friends. I hope you all had a great weekend. We had a pretty good one with friends, great music and some work on the kitchen reno, which has been our weekend routine for 8 long months now (gulp). I’m so excited because I can finally share something that’s done and looks good (ok, maybe not completely done but it still looks good). 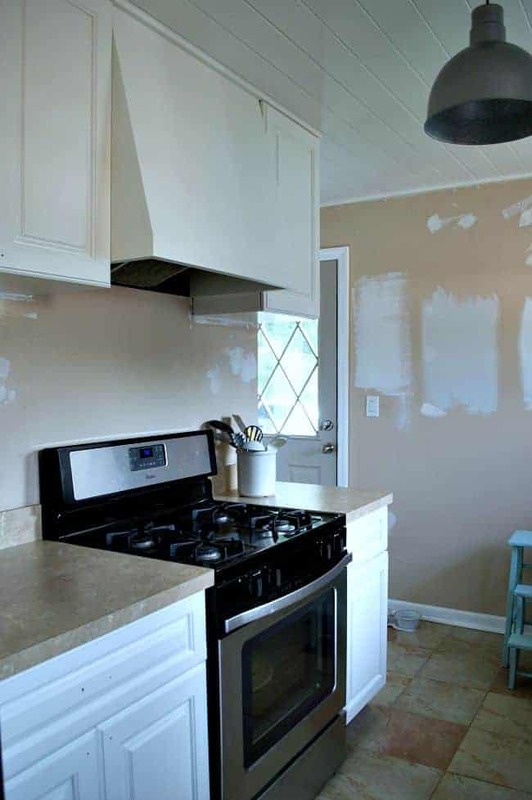 It’s the painted kitchen cabinets on the stove wall. Yay!!! Ok, just to refresh your memory (it has been 8 long months after all) or if it’s your first time here, this is where we started. 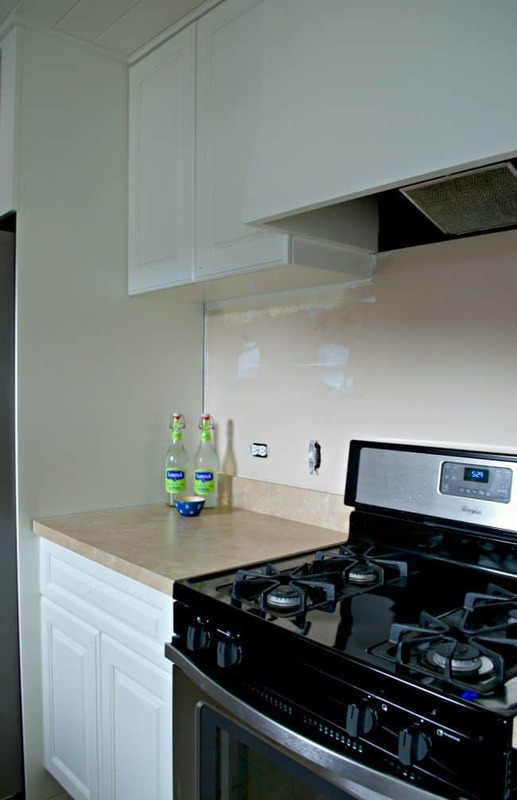 We removed the soffit, took down the upper cabinets and stove hood, added tongue and groove to the ceiling, put the cabinets back up, built a stove hood and painted all of the doors, drawers and cabinets. Phew…it’s been a lot of work, but seeing the completed doors go up yesterday made it all worth it. So, just a little disclaimer here. We have a small, galley kitchen, like really small, and taking pictures is not easy when you’re in tight quarters. We also built and installed a new cabinet on an empty wall so my vantage point for taking some of these photos had to change. 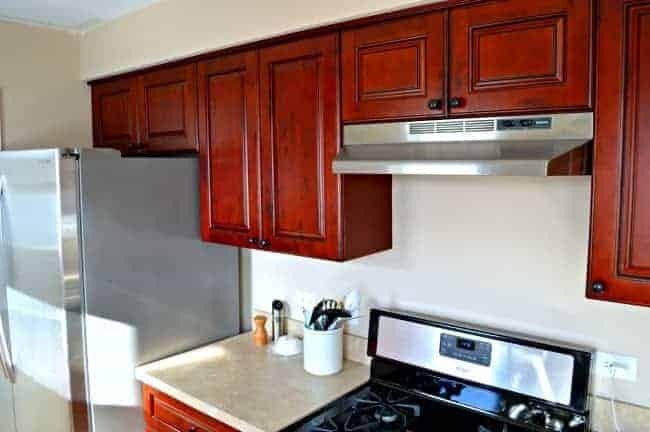 I’m sure you noticed the missing cabinet hardware, paint swatches on the swine colored wall, unfinished stove hood and unfinished backsplash. They’re all on the long list…today we focus on the beauty of the kitchen cabinets. One more thing we did, which is a bit unusual, was to take our cabinets all the way up to the ceiling. 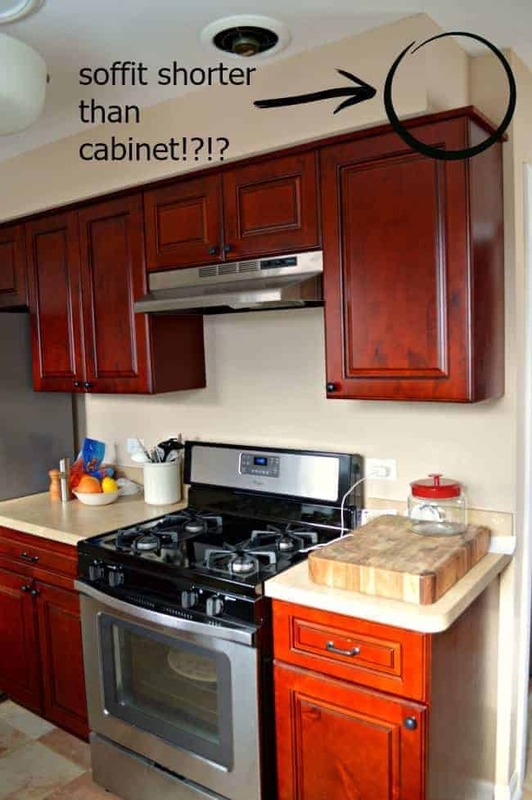 These are regular sized cabinets, not extra long, so it was pretty strange to have them so high in the beginning but it really does make the room seem taller, and in a tiny kitchen, you use any trick you can. Our original plan was to put a shelf under each cabinet to bridge the distance between upper cabinet and countertop, but we are starting to reconsider that. It’s not something we need to decide on right now so we’re still thinking about it, there’s so many other things to worry about in here. I’m really loving the white. It’s such a huge difference from the dark, reddish cabinets and now I’m motivated to get the rest of them done so I can start filling them back up. The hardware will go back on in a few weeks, I want to wait for the paint to cure before I mess up all of my hard work. On the agenda this week is to paint some cabinet doors and paint that horrific wall with the paint and spackle swatches. 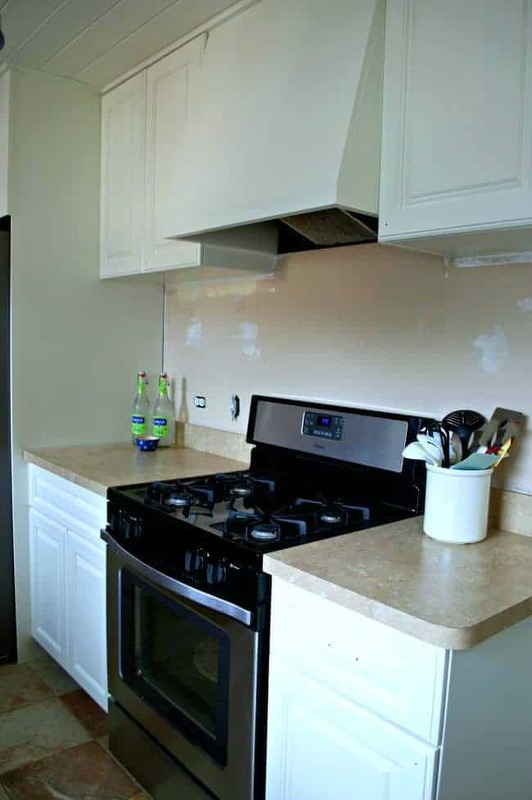 Our next big to-do is to get the countertops, and then we can install our subway tile backsplash. I’ll be back on Wednesday to share some tips I learned from painting my cabinets, I’ve learned a thing or two in the 8 months it took me to get to this point. 😉 I also have something on the other wall that I’m excited to share. What do you think about putting kitchen cabinets all the way to the ceiling? Would you do it? So true about using stools Rue. I just didn’t want that weird space between the cabinets and the ceiling and space is at a premium in my kitchen. I think I was reluctant because it’s not the norm but they look so much better to my eye too. Many thanks for stopping in today! This is an obvious statement, but what a huge difference from the red to white. Our cabinets (which are 67 yrs old) reach the ceiling and I prefer it that way, less dust and no clutter. Too right Shirlee…less dust and clutter are always a plus. Thanks for your kind words. They look great! I am sure you will love your kitchen once it is completed. Thanks so much. I’m so looking forward to the day we complete our project. Just love what you have been doing, Ceiling is beautiful. 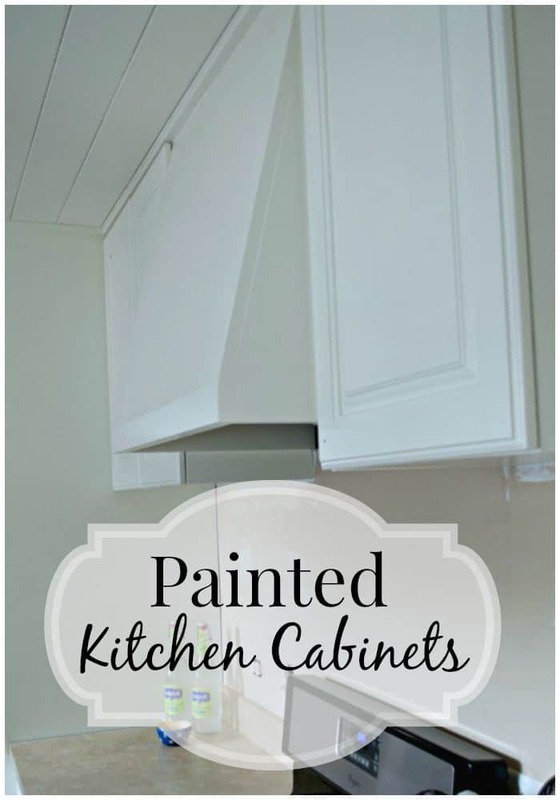 I may have missed this but what kind of paint did you use on your cabinets? Did you spray or roll the paint. I have oak, and so want to paint them white. You didn’t miss it Dee, I will be posting tomorrow, Wednesday, with the details and some tips. I have an oak vanity and painted it white when we first moved in 2 years ago, http://www.chatfieldcourt.com/painting-my-bathroom-vanity/. You can still see the texture of the wood, but it looks so much better. I love it! Thanks so much for stopping in. I love the white, so bright and fresh. We have a cathedral ceiling in our kitchen, so there’s no way that our cabinets go up that high! 😉 I do like that look though, very seamless in a small room, too. I can see where cathedral ceiling would be a problem Kim. I’m still questioning our choice but I don’t want to reserve my judgement until the kitchen is more complete. Thanks for weighing in. I like the looks of the cabinets to the ceiling but have a hard time reaching even the second shelf. I don’t like the space from top of cabinet to ceiling either, just a dust and grime collector to me. I do love the extra space you have from counter to cabinet. I wouldn’t add a shelf. It makes the room more open. 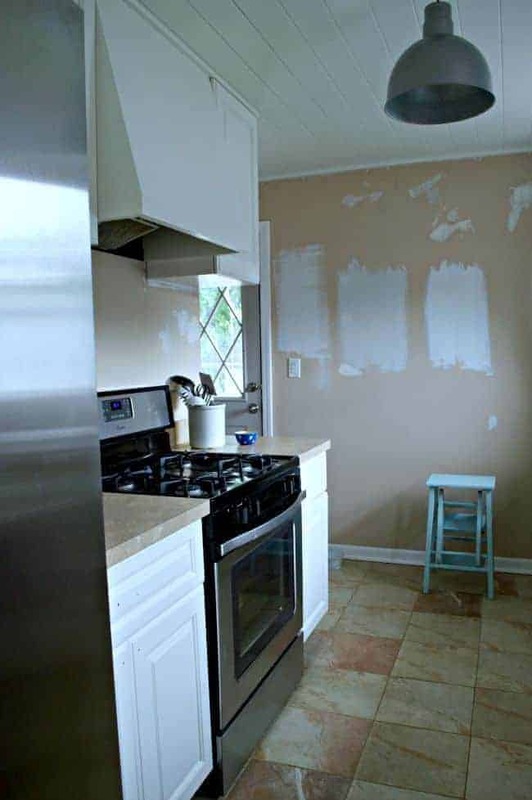 You did a wonderful job painting the cabinets. I hope you can share some tips on how to get such a great finish. Thanks so much for for stopping by and sharing your opinions today. Well, you are probably wondering why I am sending this so early. I’m home today because over the weekend I jammed my toe, ouch! It is all bruised and still a little swollen so rather than take the chance of going to work and walking on it (although I would have to go with flip-flops on, can’t get anything else on my left foot) I decided to stay home one more day and give my foot a rest. I love the white cabinets! It does make it look bigger in there. Your idea about moving the cabinets up to the ceiling is a good one. It will give you more space below, although I do like to decorate above my cabinets so I would be torn between moving them up and keeping them the same height. I imagine you will need a step stool to reach the top shelf though. I accomplished a lot with my bathroom this past week, I’m now ready to paint the tub surround and buy my new floor tiles. Yay! We have decided to go with the beadboard halfway up the wall too. My hubby likes the idea and since it is such a small bathroom we don’t have much to buy. Great work on your kitchen, can’t wait to see the countertops and backsplash! Oh my MJ, so sorry to hear about your toe. It’s not fun when your foot is hurt. It sounds like you have accomplished a lot in your bathroom. Beadboard sounds like a great idea for your space and I think it goes great with your style. I’m sure it will look awesome when you’re done. I get what you say about decorating the top of the cabinets. My style is very simple though, as I’m sure you noticed, so I wouldn’t decorate the tops. We haven’t had any problems with reaching stuff. We are both tall so I think we’ll be ok. It’s really only 3 cabinets, 3 shelves, that could be unreachable anyway, so I don’t think it’ll be a problem. I do have a great old step stool hanging around, that I snapped up at a garage sale, if we need it. Thanks for stopping by today and sharing. It was nice to see you so early in the day! 😉 Take care of that toe! Honestly, if you can reach the cabinets with them being up that high, go for it! I am not tall enough even to use the top shelf in the normal height cabinets in our kitchen! Luckily, I don’t actually need that space, so it’s not a sad thing, but a bit silly to have that many empty shelves hidden away! 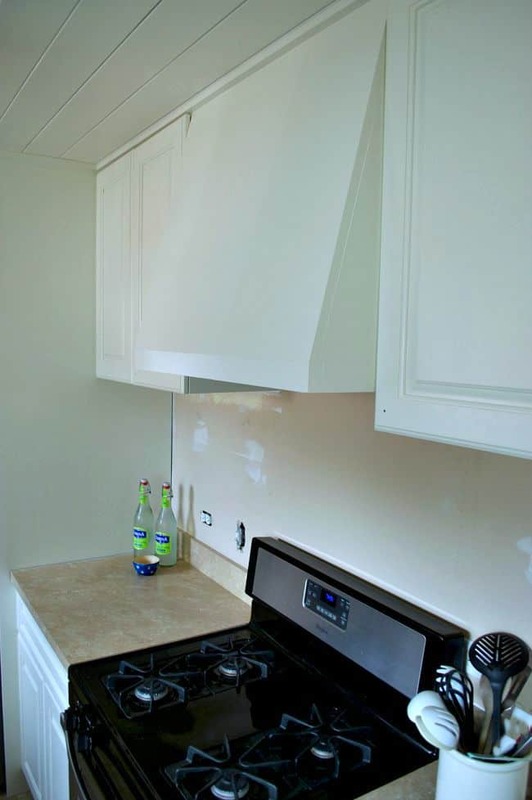 But having the cabinets go all the way to the ceiling makes much more sense than having empty space – even when that space is “styled” it still seems a bit funny to me! So true about the stove splatters Jessica, and yes, they happen in my kitchen too. 😉 I wish I had enough cabinets to have empty shelves, but sadly, that’s not the case. Putting regular height cabinets to the ceiling would be too high for me to reach anything other than the bottom shelf. I love the look of to the ceiling cabinets, but from a practical point of view, it wouldn’t be useful for me. 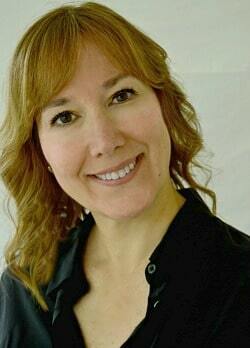 I do love your paint job – I painted my oak cabinets white last fall and wish I had done it years and years earlier. I certainly understand that Pat. I too was worried about them being to high but we are both tall and it hasn’t been a problem. 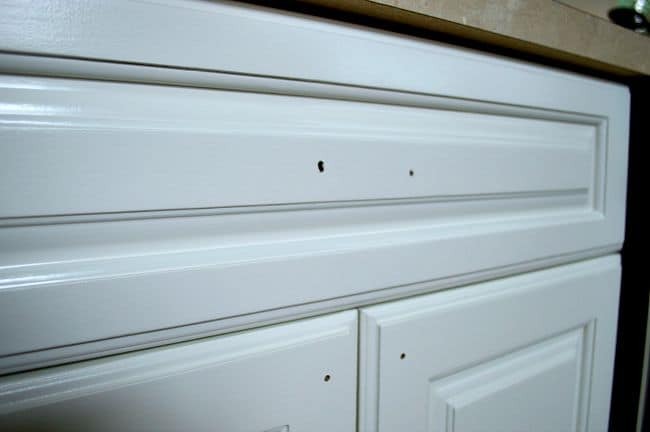 I’m glad to hear that you are happy that you painted your cabinets white. I’m sure I won’t be sorry either.